Douglas Snelling was the South Pacific architect and designer who contributed most enthusiastically to the mid 20th century cultural movement known as 'Polynesian Pop' and 'the Tiki Style'. 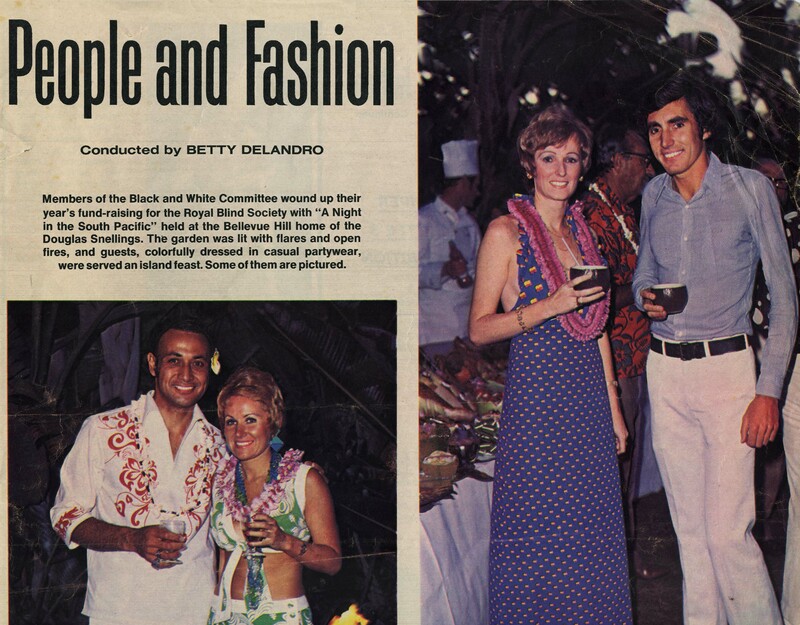 Australian Women's Weekly coverage of a summer luau party at the Snelling house in 1972. Just as modernists in Germany and France collected traditional native arts and crafts from Africa, collectors in Australia acquired tribal rugs, totems and other artefacts from north Australia's Aboriginal communities, the Middle East and Asia, and New Zealand dilettantes gathered hand-made wooden and stone artefacts and textiles from their Maori tribes, Samoa, Fiji and other South Pacific islands. When Snelling was in Hollywood in the late 193os and late 1940s, he enjoyed socialising at fashionable bars and restaurants which were decorated like luxurious, westernised versions of the tropical Pacific huts where tribal men gathered to drink alcoholic and fruit drinks. Some of the classic Los Angeles venues were operated by hospitality and trading entrepreneurs who knew expatriate lifestyles across the Pacific. Popular venues that Snelling visited in Los Angeles included Trader Vic's, and the Cocoanut Grove – and many other 'Tiki bars' began trading around West Hollywood and the Sunset Strip through and since the 1950s. In his 1950s and 1960s houses (including his own family residence at Bellevue Hill), Snelling incorporated seagrass matting on the floors of rumpus and family dining rooms and designed gardens mostly using tropical palms and flowering shrubs, often featuring trios of carved totems from Vanuatu near the carp pond or swimming pool. Snelling did not use 'fantasy island' themes in his architectural styling until the mid 1960s – when he began to cover his otherwise modern houses and concepts for commercial buildings with roofs inspired by traditional Indonesian thatched huts. (He had travelled through Indonesia by ship before his arrival in Sydney from New Zealand in 1940). 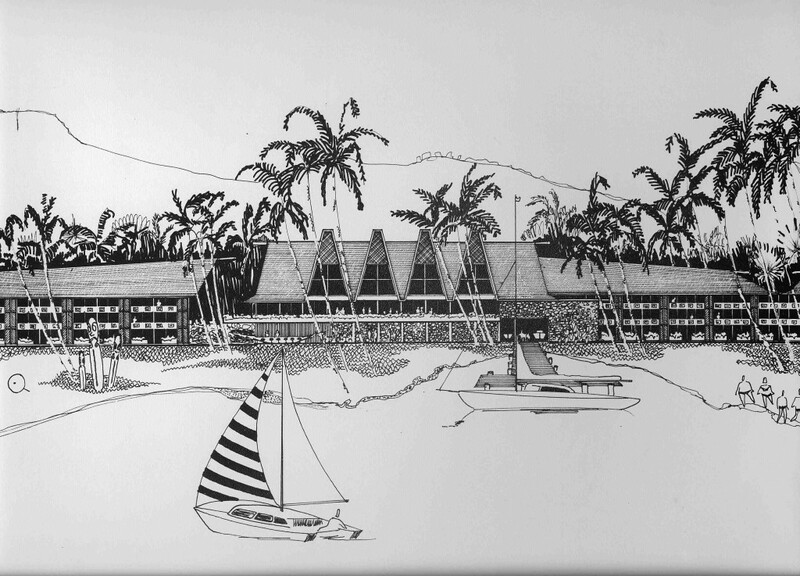 Snelling's unbuilt 1972 scheme for a commercial centre on Likuri Lei island near Nadi, Fiji. His favoured trio of Vanuatu totems are drawn at left. Snelling enjoyed comparatively little publicity for these later works, but the rooflines have been colloquially dismissed as 'kitsch' by many commentators supporting modernism's classic preference for flat roofs. However the same allegation was not applied to pseudo thatch rooflines by younger Australian architects (Kerry Hill, Peter Muller and others) after Snelling's death in 1985.